1,461 days (AKA 4 years) ago I moved from Texas to Denmark. And with this blog post, I have now written about my life as an expat 1,103 times. In these four years my blog has been viewed more than 173,000 times and I have approved the publication of nearly 7,500 comments. In fact in the month of May alone, "madsandkelli.com" was viewed 5837 times. C-R-A-Z-Y!!!! Talk about an incredible journey. As I was looking back at some the different topics I have written about during these four years, I realized that some of the things that SHOCKED (and somewhat amazed) me four years ago are now the things that I just accept as normal everyday life. I plan my schedule around the fact that I cannot do my grocery shopping after a certain hour on weeknights and that most Sundays I cannot do ANY shopping at all. 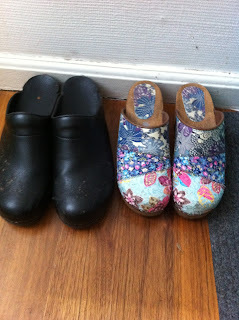 There are now TWO PAIR of træsko (wooden clogs) sitting at our backdoor... yes, one pair belongs to me and yes, I wear them every time I go out back! I hear myself saying to Mads that we should use our spare time taking a walk in the forest. I put on jeans every single day to go to work and love it because if I wore something that required pantyhose (as my old life did! ), I would look like an oddball. I buy only the amount of groceries that I can fit in my tiny little Danish fridge, knowing I will have to go back in about 3 days to shop again. If I am meeting someone downtown (and it is not pouring down rain), I often WALK to get there since we live so close to downtown. I have taken the "top sheet" off our bed and have resorted to the "all you need is your DYNE" way of thinking because honestly, whatever technology went into creating the DYNE is AMAZING. When I need/want to travel to another town in Denmark, I automatically check DSB.dk to see if taking the train would be a better option. Sometimes it is cheaper; sometimes it is not, but I now see the train as a viable form of daily transportation. I never ever ever say the words, "Why don't we take our bikes instead of driving?" I eat with a fork. ONLY a fork. I use a knife if I have a piece of meat that needs to be cut, but after cutting that one bite, I QUICKLY put my knife back down and resume eating with my fork. I still (and will always) use my American pillows. In fact, it is about time to bring a new set back over with me on my next trip. I still (and so does my Viking!) drink ICED TEA with all meals. And when I am at someone's home for dinner and the only options on the table are beer, wine, and water (to be poured in these tiny glasses), I honestly want to run to my purse and pull out a packet of Crystal Lite Peach Tea and offer it to my host/hostess to show him/her what other options there are in the world! I cook the same food I cooked when I lived in Texas--the menu at our house is always either Cajun or Tex-Mex (and my Viking would not have it any other way). For lunch I either eat leftovers (from our Cajun/Tex-Mex dinner from the night before) or something that involves peanut butter (either a PB&J sandwich or apples with peanut butter). My lunch NEVER EVER EVER includes rugbrød. Some may think I am odd or that it means I have not fully embraced my life here in DK; however, they are half wrong. Because yes, I am odd. But I HAVE DEFINITELY fully embraced my life in Denmark. And I most assuredly love my Viking. And I actually love this country most days! And if you think my Countdown Mode was bad before......just wait till Miss Corrie Ann arrives on October 14!! Haha! I still eat with just a fork, when we are at some sort of gathering and eating everyone at the table just looks at me weird because I keep the knife on the plate and my right hand (I'm a lefty) in my lap. I love this post, reminds me of me and my life here, as well as, my life back in Texas. I am pretty sure, I will always have two homes as well. Thanks for sharing this one Kelli! I am so glad that you are happy in Denmark with Mads. I am thankful for your job and your friends....but I am also happy that you have not forgotten your roots and all the people across the water that love you so much. We'll see you in 11 days! Love ya, Mom. I can't believe it's been four years! Hi Kelly, I just want to start out with saying that I love reading your blog and the way you have on putting things! It is great to have to places that you call home! What on earth is up with Scandinavians doing that inhale-yes thing?! DK has peanut butter but if your family eats JIF or something similar you will be VERY disappointed. I import all of my peanut butter (along with other mainstays I cannot get here). So pack a few in your container and then convince your family to ship them to you in care packages on a regular basis! Thanks! I foresee a future full of smuggled Skippy natural PB for me... and lots of drives over to Flensburg for other items! I like how you are able to think about the changes/non-changes in your life. I feel like someof them could be me (groceries, etc) in South Africa! Home will always be home (Philippines represent!). Ditto on the American pillows. I have my own set while my Viking sticks to his euro pillows which I cannot get used to...ever! As for the beverage choices, I also have ALOT of Crystal light, Sugar free Kool Aid and Tang in stock. I love this list! It hits the spot! Oh Kathy I'm in Aarhus too! !